Most of us are being used to the Windows Operating Systems and its good that we are at least aware of the others ones such as the Unix, Linux, etc. This doesn’t mean that the only OS that has been used worldwide is the Windows but the others also take a larger share in usage. Whatever the OS we might use, the end functionality is the same i.e. using the computers to make our tasks easier. Before we jump to the differences between GNU and Unix, let us also learn the core concepts associated with any operating system in layman’s terms. The term GNU stands for ‘GNU’s and not Unix’. 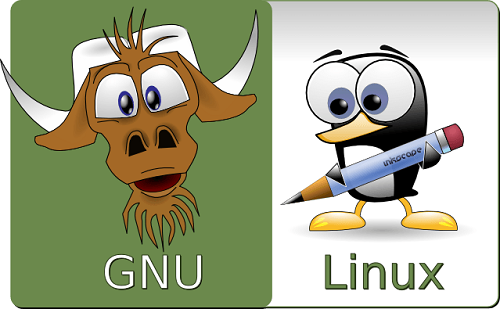 Most people think that the GNU Linux is same as that of the Unix but they are not. GNU Linux is an Open Source Project and it was derived by following Unix-like architecture. Though it had its origin from the Unix, it is by no way adapting the source code of the predecessor. Also, the GNU Linux is an Open Source and you can use the source code free of cost. I should also mention about the licensing of this GNU and the GNU project licensed under the GPL – the General Public License. You might wonder why GNU is not used as such and it comes with the Linux combination always? To answer the question, I should say that the GNU is just the source code or the software developed under the GPL. Therefore, it is an Open Source code and anybody can use it as per their needs. But it cannot be used as such as it requires an OS to interpret to the computer. For that purpose, it is combined with the Unix-like Open Source Kernel, the Linux. These two combinations are popularly called as the GNU/Linux or just the Linux or less frequently the GNU. Let us now look at the different components of the GNU Linux architecture now. The Hardware layer is the innermost one and it includes the peripheral devices such as CPU, RAM, Hard Disk, etc. The next component interacting directly with the Hardware is the Kernel. It forms the core component of any operating system and is responsible for delivering services to the upper layers from the lower layers. The next one is the Shell and is responsible for interpreting the user’s commands in terms of the kernel’s functions. 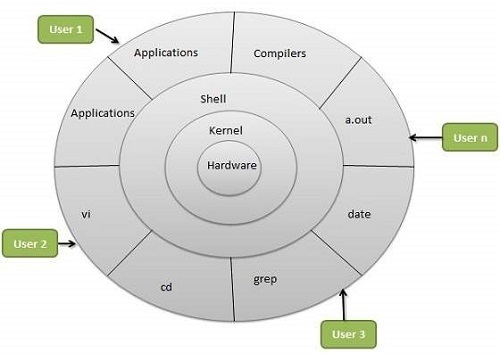 With the Shell in place, we are not confused about the complexity associated with the kernel. Just imagine the situation where you need to give the commands in binary digits as the computer understands only that! It’s hectic, right? That’s where the Shell enables us to give commands in our own language and not in the machine understandable form. The outermost layer is the set of utility programs and we call it as Applications as well. These programs are designed to perform certain tasks like printing, compiling, etc. we can also say that these utilities are the immediate components through which we interact with the computer and, in turn, the interaction go further down the other layers. The GNU project’s logo was originally designed by Etienne Suvasa and was later altered by Aurelio Heckert. 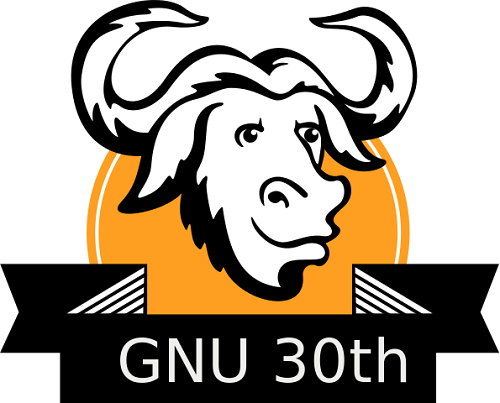 Here you can see the latest logo of the GNU and it was released by the Free Software Foundation in 2013. 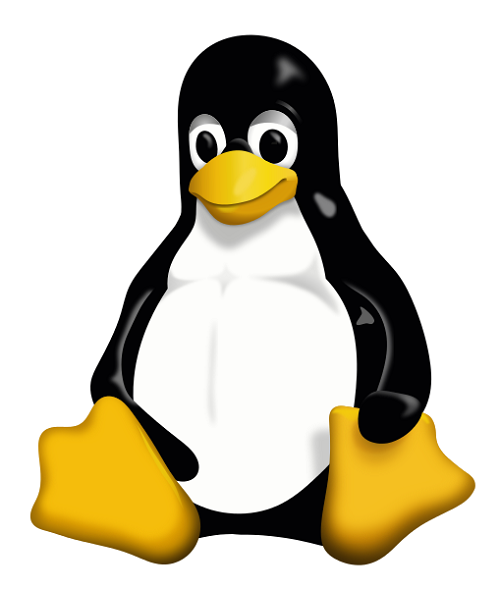 The commonly used Linux logo is as below. It is termed as Tux. It is a multitasking and multi-user operating system and was originally developed at Bell Labs by Ken Thompson and Dennis Ritchie. Since its inception, the Unix OS is getting bettered every now and then. It takes the pride of being the model for the Linux OS and it has three main components – the Kernel, the Shell, and the programs. You can now link the Unix with Linux architecture that we have seen above and both of them share a common architecture. As we have discussed earlier, The Kernel is the innermost component that interacts with the hardware and performs functions such as file storage, allocating memory space, time, etc. The Shell is the Command Line Interpreter (CLI) that interprets our commands into machine readable form. We can modify Shell’s interface as per our convenience. The Programs are stored as files and are denoted with the Process Identifier (PID) to differentiate from that of the data files. Below is the logo of the Unix and it is just a written text of the same. GNU is the software developed by Richard Stallman and he was a hacker from MIT AI Lab. He was frustrated by the closed source programs that are always copyrighted and not available for further research or use. The Unix and other Closed Code operating systems are made available commercially without letting the source code out. This was a major frustration for the Mr.Richard Stallman and the result of such a frustration is the GNU – an Open Source software to access the Kernel. The UNIX was originally developed by Ken Thompson and Dennis Ritchie for the Bell labs and it was named as AT&T UNIX. Even though the GNU was up for implementation, the software needs a Kernel to interact with the hardware. There comes the usage of Unix and the Open Source Project used an Unix-like Kernel architecture to support the GNU. So we could say that GNU by itself could not function and it needs the Kernel. Therefore, the Kernel of Unix was imitated and the new Kernel was designed. The Unix-like Kernel along with the GNU is often termed as GNU/Linux or simply Linux. The GNU software by itself could not run as the Kernel is missing. But the UNIX is made of the Shell as well the Kernel and hence it could function on its own. From our previous discussions, it is clear that the source code of the GNU is freely available to the public and it is termed as the Open Source code. But the source code of Unix operating could not be viewed as it is a Closed Source code. We have come across their logos in our above discussions, and let us get a gist of what we have seen earlier. The GNU uses either the symbol of a Penguin or the Gnu which is a dark antelope. The UNIX just uses a plain text of its name as the logo. The GNU is supported by the Free Software Foundation and is licensed under the General Public License (GPL). It is freely available to the public and the source code can be altered as per our requirements. But the UNIX’s license is usually noted as Trademark of Bell Labs, Trademark of AT&T Bell Labs, or Trademark of X/Open. The Kernels of GNU/Linux and the UNIX are more similar and come with differences only in the Shell. Both the kernels are similar but they have its own source code that GNU/Linux uses the Open source code whereas the UNIX uses the Closed source code. We could even say that the GNU/Linux and the UNIX differ only in their Shell as they share the common Kernel that was originally developed as AT&T UNIX. Those are all about their differences and let us look at in a tabular form. 1. Origin It was developed by Richard Stallman and he was a hacker from MIT AI Lab. It was developed by Ken Thompson and Dennis Ritchie for the Bell labs. 2. Initially named as GNU and it was the name given for the developed Software. Named as AT&T UNIX as it was developed at Bell Labs. 3. Functioning on its own The software (Shell) by itself could not function as it needs a Kernel to interact with the hardware. The UNIX is composed of both the Shell and the Kernel and could function on its own. 4. Relies on? The GNU being just Shell software relies on any Kernel and rightly, the UNIX Kernel was deployed. It does not rely on any other OS, it has its own components. 5. Source Code The GNU Source Code is freely available to the public. We can modify the code as per our requirements. The UNIX source code is not available for the public. 6. Logo The GNU uses either the symbol of a Penguin or the Gnu which is a dark antelope. It uses a plain text of its name as the logo. 7. Licensing It is licensed under the General Public License (GPL). The UNIX’s license is usually noted as Trademark of Bell Labs, Trademark of AT&T Bell Labs, or Trademark of X/Open. 8. The Shell and the Kernel It has its own Shell, the GNU, but it uses the- UNIX-like Kernel. It has its own Shell and the Kernel component. Hope the article has helped you! If you still feel that something is missing, please let us know. Ramalan Harifa. "Difference between GNU and Unix." DifferenceBetween.net. August 1, 2017 < http://www.differencebetween.net/technology/software-technology/difference-between-gnu-and-unix/ >.